In all this talk about illegal immigrants coming across the border into the United States, sometimes we have a tendency to speak abstractly, to use our sociological background to place large quantities of individuals into a group, and to not only forget that every person is a human being but also to consider what life in America is like for those who crossed legally and who may be growing up as second generation immigrants. In Youssef Delara’s daring feature English as a Second Language, we meet two very different immigrants in the form of Bolivar De La Cruz (Kuno Becker), an illegal immigrant who crosses in to earn much needed income to support his pregnant wife and Lola Sara (Danielle Camastra), a talented student who spends her nights escaping into nightclubs and one-night stands, struggling to find a balance between her own needs and goals as a second generation immigrant with those of her parents. Maria Conchita Alonso turns in one of the film’s finest performances as Lola’s domineering “old-world” mother who, still bitter at all she’d sacrificed to raise her daughter, finds herself resenting Lola’s independence and free-spirit and wants her daughter to meet the expectations she has in putting family first by becoming prominent, successful and wealthy. After Lola and Bolivar literally crash into one another in an auto accident and Lola must complete community service to make amends for driving while intoxicated, they reunite in a classroom setting with Lola assistant teaching English as a Second Language in East Los Angeles to a roomful of students (including Bolivar) who realize that in order to secure any kind of employment or get ahead, they must learn the language of their adopted homeland. The film takes an even darker turn as the handsome Bolivar catches the eye of a manipulative actor and nightclub owner Norman Benjamin (John Michael Higgins) who recruits the young man to be a strip dancer for his amoral, greedy clientele. While everything begins to coincide in a rather melodramatic middle section that results in a slightly predictable conclusion, overall, ESL is compelling stuff and earned the film as well as director Delara countless accolades from festivals across America including honors at Newport Beach Film Festival for Outstanding Achievement in Filmmaking among others. 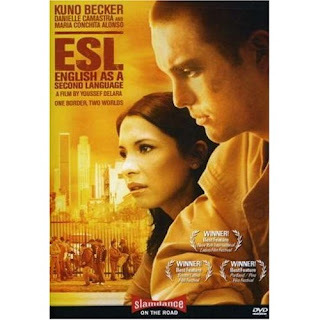 While it’s Lola who is arguably set up to be the most relatable character for American audiences as she’s the one who was raised on our soil, the film’s heart belongs to Bolivar and Kuno Becker’s mesmerizing portrayal is sure to impress those who get a chance to track the film down, now that it’s been made available by Slamdance on DVD.